One of the most impressive improvements you could make to any living area of your home is the installation of the Estonia polished mocha crème limestone fireplace and fire. This is a gorgeous natural stone fireplace with a contemporary look whose fine quality Portuguese limestone has been polished to a high gloss finish. This is an ideal fireplace choice for homes that have no existing chimney or flue and is suitable for Class 1 or Class 2 operation in addition to the option of a slimline precast flue. 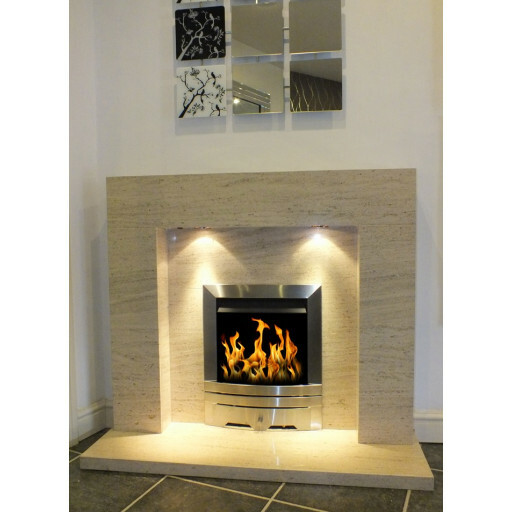 The Estonia polished mocha crème limestone fireplace package includes the hearth and back panel, as well as a choice of electric or gas fire trim in contemporary looking brass, stainless steel or chrome. These metals make a perfect aesthetic pairing with the highly polished limestone and the stone's neutral colour makes this fireplace a good choice for matching almost any existing interior décor. This is a fireplace that quickly becomes a focal point for the room, with the double downcast lights adding a very dramatic flair that draws attention to the crackling fire contained within this very beautiful work of craftsmanship. Solid stone fireplace with a fire included,how could we resist at this price. ABSOLUTE BARGAIN,SOLID STONE FIREPLACE WITH LIGHTS AND A FREE GAS FIRE,HOW COULD WE NOT BUY ONE. .We saw this fireplace in the Burnley showroom and instantly knew it was the one for us,then we got the best news that you get a free gas fire with it,couldn't believe our luck,don't know how they do it for the price. Great value!! fireplace and gas fire for £649. Fantastic little package, cant believe the quality for the price. Just had our new fire and fireplace fitted,Can't believe we got a new fire and fireplace for £649 ! !Looks Really nice in our living room,fitters were great too. Wanted a good quality fireplace and fire package at a bargain price,we certainly got that here! !